Setting Limits With Kids: "You're Doing It Wrong." - but, "you're doing it wrong" and if you'd just listen, you could be doing it right. Doesn't exactly inspire confidence in kids that we are on their side and ready to help, does it? If you find yourself habitually reacting to your children's behaviors with impatience, frustration, control or anger, you may be building walls in your communication by sending unintended messages of "you're doing it wrong." Your adrenaline is pumping and now, you've shifted from thinking and empathizing to defending and attacking. Why do we assume our kid's reactions are attempts to destabilize our limits? That level of consciousness causes us to meet resistance with fear and uncertainty. We're all fired up and ready stave off refusal and upset with negotiation, legitimizing and logic. Are we so thrown by our children's developmentally appropriate responses that we have been conditioned to let fear override our thinking? Unfortunately, I think that YES - this has become the rule, rather than the exception. Do you assume that your kids do things just to "make you angry" or because "they need to learn a lesson," or do you see an evolutionary impulse to fight for what they need and self-protect? In actuality - in those moments where you feel the need to force - YOU are shutting down. 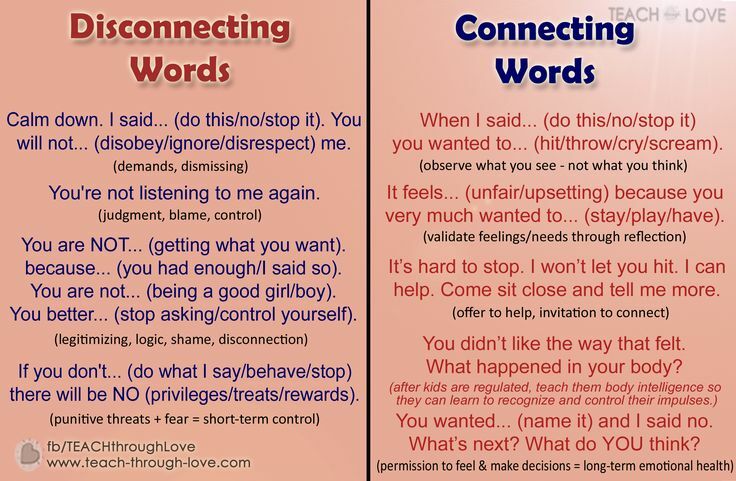 And then, expecting your children to provide you with the conditions you require to change your behavior - you may yell, insist, demand, ignore or control - until what you see changes how you feel. The threat of disconnection may work in heated conflicts or with an easy temperament, but it has serious risks and long term consequences that undermine your goals for raising cooperative, well-regulated, problem-solving and compassionate people. -- are not an affront to your parental authority but a reaction based on limited experience and a natural, inherent drive to BE, DO and HAVE. Your child is not playing offense to get ahead of you but actually playing defense, blocking pain with denial and refusal, or offloading the upset through tears and tantrums. These are healthy, beneficial emotions. The goal is not to protect your kids from their feelings, nor control them, but to STAND BY and be a WITNESS to the instability they feel. So often, we make parenting about us: what we need other people to DO so we can FEEL better, validated, recognized or in control. She always talks back to me. He is doing it just to make me mad. Can we step outside the self-referenced perspective for just a minute to see that children who act out - FEEL BAD and/or are TOO YOUNG and don't know how to DO BETTER from that place without your help and connection? Not enough skill, experience and/or feelings of disconnection. That's the problem - not the behavior. So help your kids manage the internal by offering non-judgmental support and skills and they will adopt coping tools which will allow their development to unfold INTO better decisions and better behavior. The more you push, force, or try to reason with an upset child - the further you will destabilize your OWN limit, and your child's ability to mature out of those limiting behaviors. The more you acknowledge, validate, and empathize while confidently holding your limit with a neutral tone - the better you both will become at managing your emotions in response to what you perceive. Lori Petro, BS Ed., is a Child Advocate, Certified Parent Educator and Mom. She founded TEACH through Love as a vehicle to help families heal multi-generational cycles of abuse and trauma by providing parents with tools for communicating and creating strong relationships with kids. As an adult with Aspergers, Lori understands the demands of parenting kids with special needs.